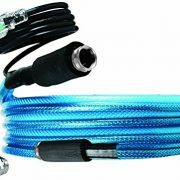 ★THE ORIGINAL GRAY GARDEN HOSE – THE BEST HOSE YOU’LL EVER FIND IS FINALLY HERE – Introducing the 2016 Snake version high performance expandable garden water hose by Titan. 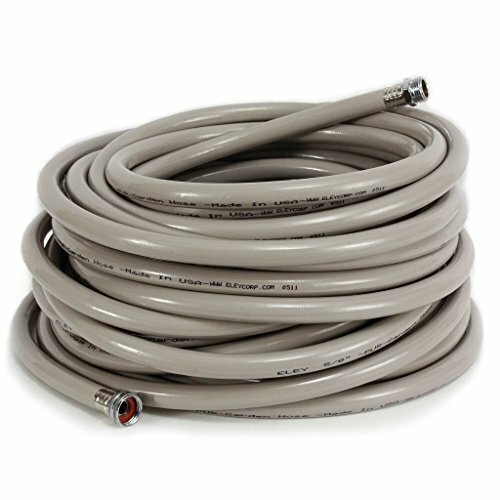 The most durable and strongest 100ft hose you will ever use. 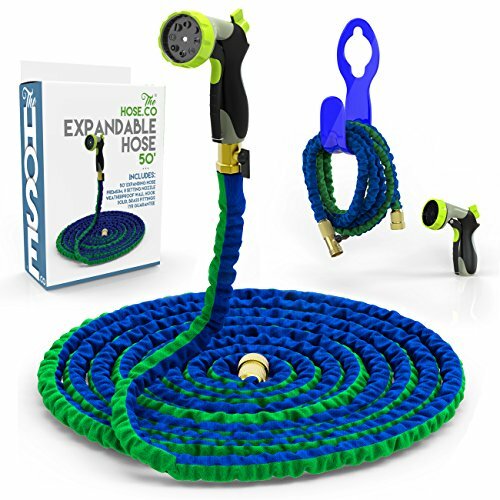 ★FUNCTIONAL DESIGN MAKES IT IDEAL FOR EVERYDAY USE – It’s amazingly lightweight for a 100ft hose and it’s so flexible that you will be able to use it effortlessly every day. 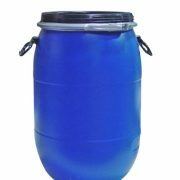 Its durable and efficient design makes it capable of withstanding heavy usage. 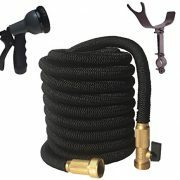 ★ FORGET ALL THE USUAL HOSE PROBLEMS – No more kinking, tangling or twisting! 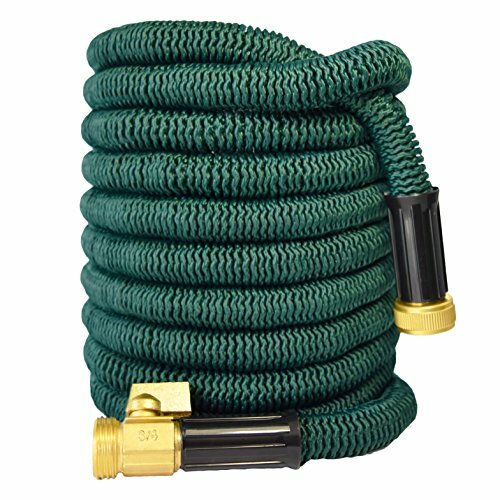 This premium garden hose by Titan is designed to never tangle up. 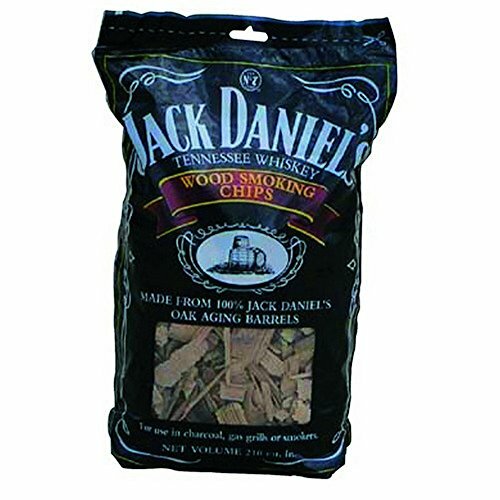 That guarantees better performance and life-span. NEW 2016 DESIGN INNOVATIVE HOSE with double layer latex core which prevents splitting or bursting. Tested time and time again to assure you the strongest hose on the market today! STAINLESS STEEL SOLID CONSTRUCTION HOSE HOLDER (Patent Pending) which cradles the spray nozzle. 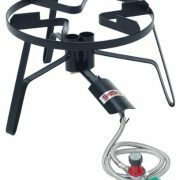 Adjustable to accommodate water spigots of all angles. Only available at TruTec. PREMIUM QUALITY SOLID BRASS CORROSION RESISTANT FITTINGS. 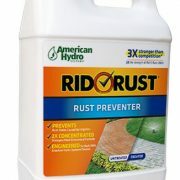 Guaranteed not to leak or rust. 100% CUSTOMER SATISFACTION GUARANTEE – Order with confidence! Only with Golden Spearhead you are covered with our 60-DAY MONEY BACK GUARANTEE, just contact Golden Spearhead and EVEN IF 60 DAYS HAVE PASSED, we’ll go above and beyond to make sure you are happy with your purchase! INTRODUCING FROM GOLDEN SPEARHEAD – WON’T LEAK, WON’T BURST, EXTRA DURABLE CORE – Conventional expanding hoses will suffer water leaks from bursting after being used several times. TopHose, thanks to its stronger core, perfectly eliminates water leaks no matter how long it has been used. 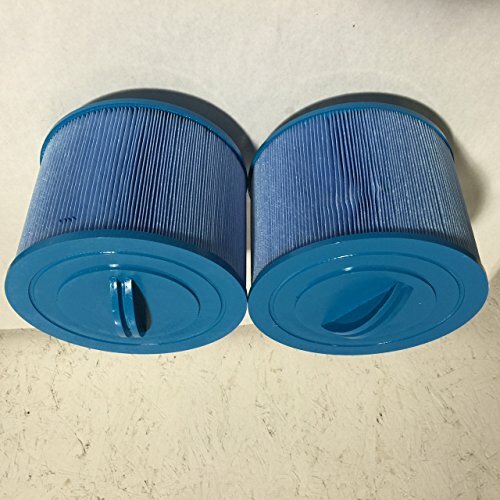 BASED ON CUSTOMER FEEDBACK – TopHose has been designed and manufactured based specifically on customer feedback for expandable hoses, resulting in a pocket hose that is by far and away the strongest retractable hose on the market. TO RECEIVE THE BENEFITS OF THE REAL GOLDEN SPEARHEAD HOSE MAKE SURE IT IS GOLDEN SPEARHEAD – AVOID COUNTERFEIT PRODUCTS! ★2016 MEWEST TELESCOPIC GARDEN HOSE: flexible design, the shape of a novel, round, bright, 360 degrees impact on your vision, it’s beauty to your surprise, let you more love. ★JUST TO MAKE LIFE MUCH EASIER! 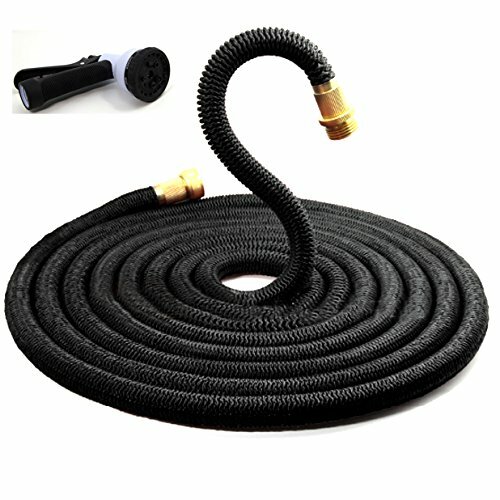 This newly designed expandable water hose Black will Never tangle, twist, or kink, flexible and easy to handle and to storage! ★SPACE-EFFICIENT! 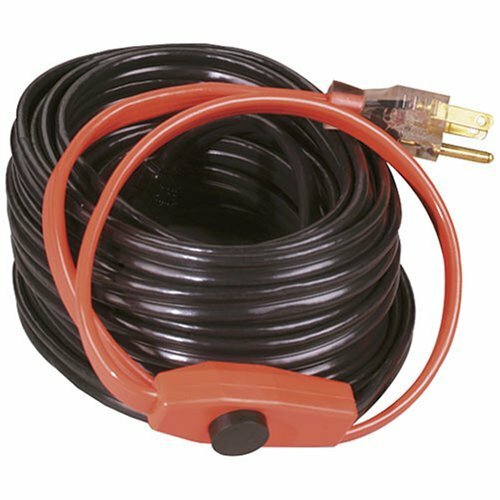 This amazing water hose starts out 33 Feet and expands to 100 Feet with water pressure, but returns in seconds to 33 Foot after water is out! 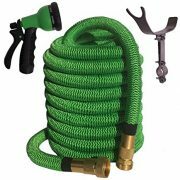 ★THE ORIGINAL GRAY GARDEN HOSE – THE BEST HOSE YOU’LL EVER FIND IS FINALLY HERE – Introducing the 2016 Snake version high performance expandable garden water hose by Titan. The most durable and strongest 150ft hose you will ever use. 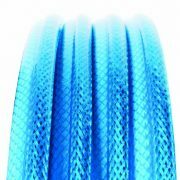 ★FUNCTIONAL DESIGN MAKES IT IDEAL FOR EVERYDAY USE – It’s amazingly lightweight for a 150ft hose and it’s so flexible that you will be able to use it effortlessly every day. 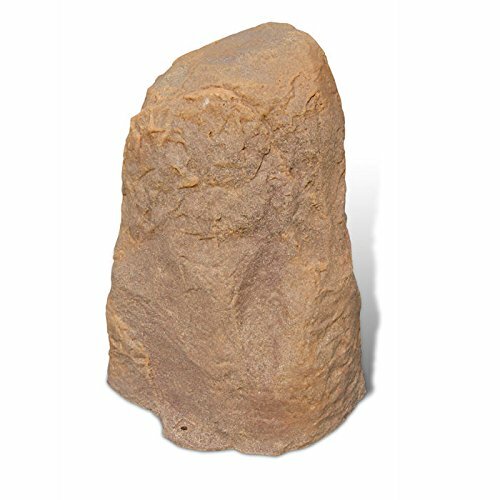 Its durable and efficient design makes it capable of withstanding heavy usage. ★THE ORIGINAL GRAY GARDEN HOSE – THE BEST HOSE YOU’LL EVER FIND IS FINALLY HERE – Introducing the 2016 Snake version high performance expandable garden water hose by Titan. The most durable and strongest 50ft hose you will ever use. 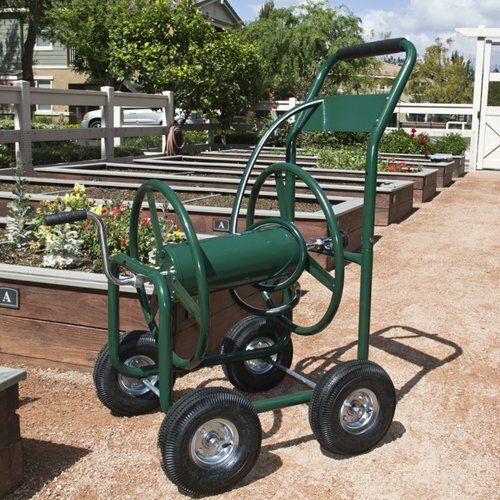 ★FUNCTIONAL DESIGN MAKES IT IDEAL FOR EVERYDAY USE – It’s amazingly lightweight for a 50ft hose and it’s so flexible that you will be able to use it effortlessly every day. 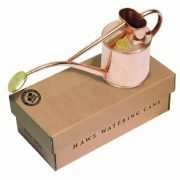 Its durable and efficient design makes it capable of withstanding heavy usage. NEW 2016 DESIGN INNOVATIVE HOSE with triple layer latex core which prevents splitting or bursting. Tested weekly to assure you the strongest hose on the market today! 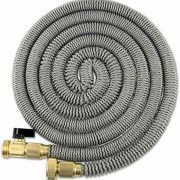 ★THE ORIGINAL GRAY GARDEN HOSE – THE BEST HOSE YOU’LL EVER FIND IS FINALLY HERE – Introducing the 2016 Snake version high performance expandable garden water hose by Titan. 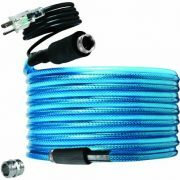 The most durable and strongest 75ft hose you will ever use. 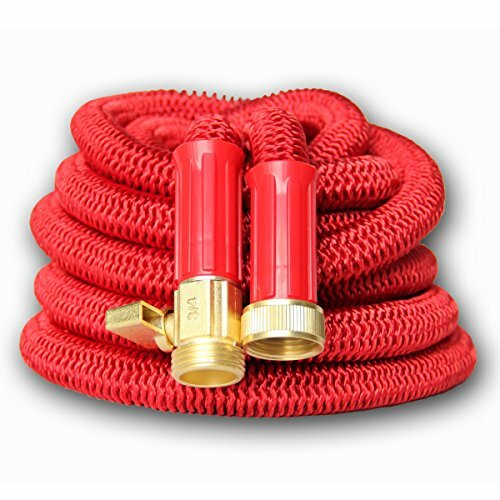 ★FUNCTIONAL DESIGN MAKES IT IDEAL FOR EVERYDAY USE – It’s amazingly lightweight for a 75ft hose and it’s so flexible that you will be able to use it effortlessly every day. 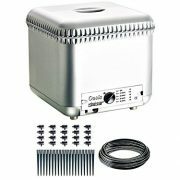 Its durable and efficient design makes it capable of withstanding heavy usage. ★LIGHTWEIGHT WILL NOT TWIST TANGLE OR KINK. This hose does everything the other hoses claim only better. Don’t waste your hard earned money on products that work for a couple days or weeks then fall apart. ★SOLID BRASS ENDS. No more leaks around the plastic fittings. 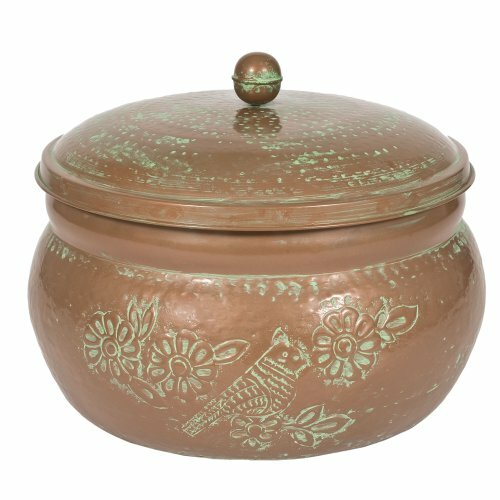 We designed the mold to give you the best brass fittings available today. Don’t be fooled by imitations.